This image was a request by a special client – my brother. He had an idea for a wallpaper and gave me a rough sketch on position of the anvil and an explanation what he would love to see. Since he is always to committed to things he does – forging in this particular case – I wanted to create something that would suit him. 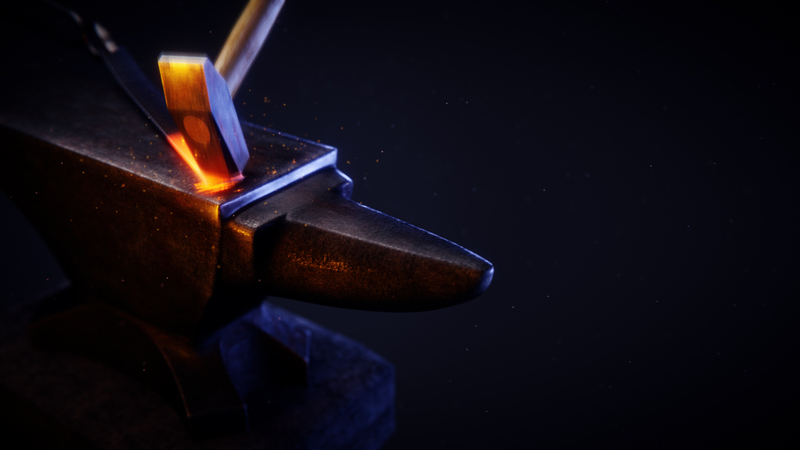 So I started working on the anvil, the hammer, the pliers and their composition. I did chose an overall dark atmosphere using blue as the environment light since it would contrast the steaming hot orange & yellow iron the best. When I gave him the first version of the image – all proud of what I had achieved – he basically said it was ok but the sparks and position weren’t right. In his drawing he drew the anvil positioned to the left – I somehow didn’t pay enough attention to this ‘little detail’ and just tried to cover up the fact that no character is holding the tools – how foolish of mine. The sparks didn’t look yellow enough and just to thin for sparks of hot iron. So I had to redo it – like a lot. Mirroring the image was not an option for me, so I did rebuild the lights, the objects positions (I tweaked it a lot compared to the first version) and did add a bit more glow here and there, a bit of motion blur and a few more stylistic things like depth of field & vignette. This one turned out really nice for my personal taste – and I hope he’ll like it as well. Enjoy bro!